My sample was knit with some of my incredibly soft, smooth, fluffy must-have Silk Camel yarn on US Size 6 Nova Cubics. This yarn is my new love - I've kept a skein for myself and will be knitting something with it very soon! YUMMY, it is so exquisite! I did things a little differently this week. I used a random stitch generator to get the stitch you see above. Pretty awesome, isn't it? This is the generator I used, but there are others out there. Google 'random stitch generator' or 'random lace generator' or a similar phrase and you'll find some. There are even cables! Lots of fun, I hope you try. And please stop by my Facebook page and share a picture of your own generated stitch! 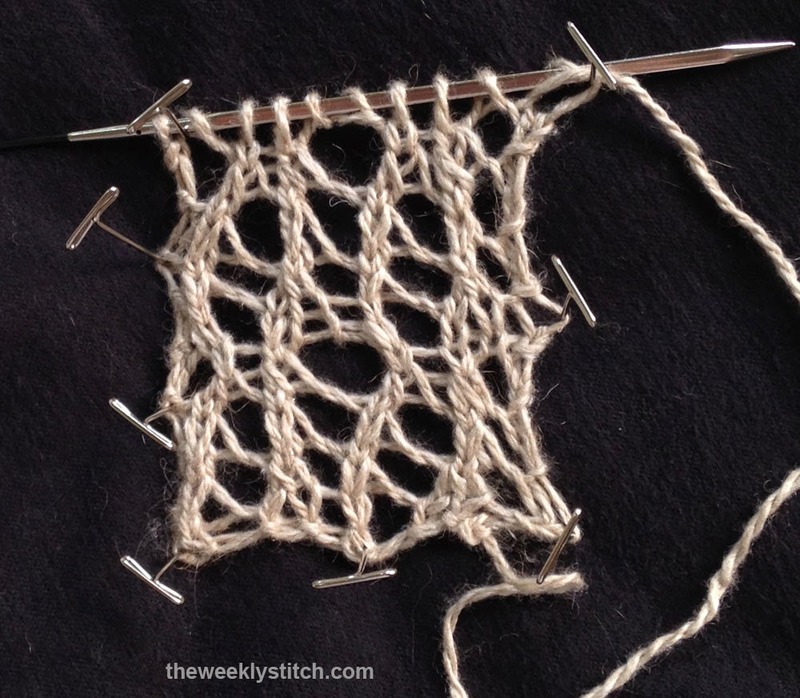 For my stitch, I do recommend at least one extra stitch on each edge because there are yo's at the beginning of some rows; for a project using this stitch, a border would be nice. The Generator ----> Click here. Row 7: *yo, ssk, ssk, yo -- you will have a double yarn over here, since the row begins and ends with a yo. When you come to this double yo on Row 8, you will p the first strand, and k the second strand.